Mark Mellon, Napoleon Concerto. Treble Heart Books, 2009. Pp. 342. ISBN 9781936127085. $13.50. It is 1806. Napoleon Bonaparte rules France and most of Europe. Yet Britain remains out of reach; however strong Napoleon may be on land, at sea the Royal Navy is supreme. Then an engineer named Robert Fulton meets an Irish ex-naval captain named Wolfe O’Sheridane at a Paris salon. Fulton has a design for a powerful engine and his new friend has the audacity required to get them both an interview with Josephine herself. Mark Mellon’s Napoleon Concerto (the title is presumably a reference to Anthony Burgess’s Napoleon Symphony) is a steampunk, alternate-history retelling of the Napoleonic wars as they might have happened had France possessed the naval might necessary to challenge the British on their home ground. It’s an idea that, if thoroughly researched and well worked, has the potential to be both a fun thought experiment and a romp. Unfortunately, it doesn’t work out that way. From the start, Mellon throws us possibilities that might be interesting. At the beginning of the book the major point-of-view character appears to be Robert Fulton himself. Fulton is a genius, though the author soon seems to forget that aspect of his character. He’s fond of money and status and averse to taking risks. All of these traits make him extremely unhappy about the schemes into which his association with O’Sheridane leads him. Moreover, O’Sheridane through Fulton’s eyes appears almost the charismatic fellow the the text seems to expect the reader to believe he is. Fulton’s attraction towards O’Sheridane is pretty extreme—there are moments when Fulton is noticing O’Sheridane’s “muscular thigh next to [his]” where one would think the novel was going in an entirely different direction. This is a point of view (and possibly a relationship) that might be quite fun to explore. Almost immediately, though, the novel’s focus shifts from Fulton’s contemplation of the Irishman to O’Sheridane himself. O’Sheridane remains the book’s focus for most of the rest of the plot, bar a short period towards the end where Bonaparte takes centre stage. But O’Sheridane is entirely uninteresting. He is too typical an Irishman—the name that could have come out of a bad Mills and Boon romance aside, he is reckless, audacious, red-haired and green-eyed and charming with the ladies. He is a passionate Irish nationalist, and we soon discover that his services to Napoleon are rendered with the condition that should the French triumph, Ireland will be freed. O’Sheridane’s storyline once again shows the possibility of being interesting with the introduction of Ghislaine, a beautiful widow with her own reasons to be distrustful of Bonaparte. Much is made of Ghislaine’s brilliance, and her capacity to outwit people. On meeting her O’Sheridane is “intrigued by the prospect of how far she would go in her efforts to manipulate him.” So was I. It doesn’t happen. Ghislaine is one of two female characters in this book, the other being Josephine. This may not be a particularly low number for a war novel set at the beginning of the nineteenth century, but it is certainly unnecessarily low for a novel set to a large extent in Parisian society. Josephine is just portrayed as shrewd, but overly fond of shopping. Ghislaine fares a little better, since as I mention above the book makes much of her intellect. Yet we never actually see this intellect, only hear other people referring to it (often in rather cringeworthy terms: O’Sheridane explains that “for a minute I thought myself in conversation with an exceptionally well-informed minister of the Council of State rather than a beautiful young woman”). As for the war itself, Fulton’s engine destroys the careful balance of power that prevails at the beginning of the book so that everything that follows is distinctively one-sided. This is not necessarily a bad thing; in the real world most armies are not entirely evenly matched, and the portrayal of a country’s defeat is probably far more realistic. And Mellon’s shipboard battles are some of his best writing. On the other hand, a conflict where one side doesn’t have the ghost of a chance isn’t exactly riveting. And this is what is strange about Napoleon Concerto. Potentially interesting characters and situations are continuously tossed out or forgotten about. No character actually undergoes any sort of development; what we know about them as soon as they are introduced (Fulton is greedy and materialistic; Ghislaine is pretty, clever and attracted to O’Sheridane; O’Sheridane is reckless, soulful and Irish) is what we know about them at the end of the book. Perhaps Napoleon himself is the only character to escape. And yet it’s never clear what these elements are being jettisoned in favour of; certainly not plot. 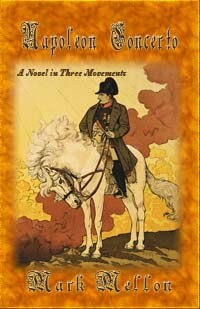 Napoleon Concerto is a book containing a number of possible plots and fascinating characters. But in touching on all of them Mellon does justice to none.